The regal presence Aretha Franklin exuded in life was captured at her viewing on Tuesday, with the late Queen of Soul in a gold-plated casket dressed completely in red, including high-heeled pumps, proving, as one person put it, that she was a "diva to the end." 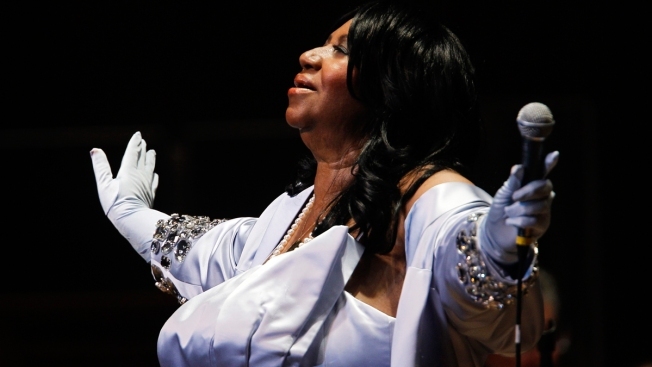 As Franklin's powerful vocals from classic gospel performances were piped through the Charles H. Wright Museum of African American History in Detroit, the Rock and Roll Hall of Famer looked as if she was preparing for one more performance. She wore red lipstick, and her hair was cut short. Her dress — with its ornamental elements and sheer netting fabric — was reminiscent of an outfit she would wear onstage and "something she would have selected for herself," her niece, Sabrina Owens, told The Associated Press. Mourners poured into the museum to pay their final respects to Franklin, who died Aug. 16 of pancreatic cancer at the age of 76. The two-day viewing was part of a week of commemorations for the legend, who will be laid to rest on Friday. The Wright Museum is a cultural landmark in Detroit , where Franklin grew up and spent most of her life. Museum board member Kelly Major Green said the goal was to create a dignified and respectful environment akin to a church, the place where Franklin got her start. 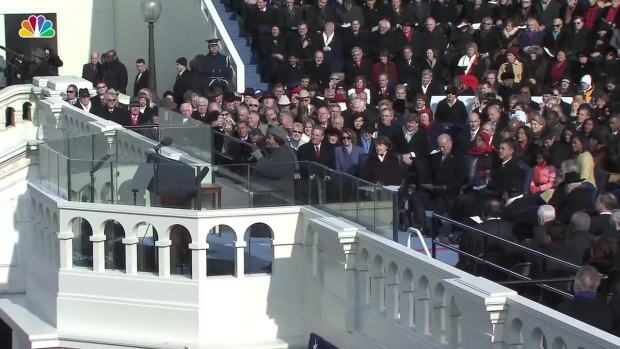 Aretha Franklin sang a beautiful rendition of “My Country ’Tis of Thee” at the 2009 inauguration of President Barack Obama. "What we wanted to do is be reflective of the Queen," Green said. "It's beautiful. She's beautiful." Green said Franklin's attire and pose communicated both power and comfort, as she did in life. 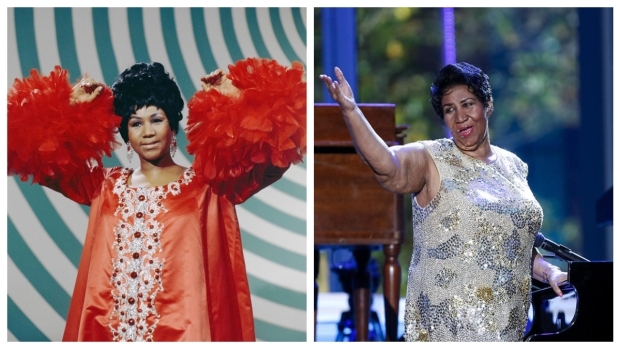 The shoes, in particular, show "The Queen of Soul is diva to the end," Green said. Fans strolled by the casket, some in tears; one woman blew a kiss to Franklin, who was surrounded by massive arrangements of roses of different hues. Tammy Gibson, 49, of Chicago said she arrived about 5:30 a.m. She came alone but made fast friends with others who sang and reminisced. Growing up, Gibson said she heard Franklin's music "playing all the time" by her parents, who "told me to go to bed — it's an adult party." Outside the museum, she said: "I know people are sad, but it's just celebrating — people dancing and singing her music." Indeed, a group of women were singing her hit "Freeway of Love." Franklin had been a constant in Gibson's life. "I saw the gold-plated casket — it dawned on me: She's gone, but her legacy and her music will live on forever." Owens said she began planning for this week's festivities earlier this year. "After all she gave to the world, I felt we needed to give her an appropriate send-off that would match her legacy," she said. "She loved the city of Detroit and the city of Detroit loved her." The roses that surround the casket, Owens said, reflected her love for the flower and her propensity to send arrangements "in grand fashion." Franklin was dressed in red symbolic of her membership in the Delta Sigma Theta Sorority. The service organization of predominantly black women planned a private ceremony Tuesday night in the museum in honor of Franklin. The Smithsonian National Portrait Gallery in Washington, D.C., has placed a poster of Aretha Franklin on display in the "in memoriam" section of the museum. The setting for the viewings could not be more fitting, according to Paula Marie Seniors, an associate professor of Africana studies at Virginia Tech. "I think it's incredibly significant — she is being honored almost like a queen at one of the most important black museums in the United States," said Seniors. The Queen of Soul, Seniors said, was "a singer of the universe." Yet she added that Franklin also was "so unapologetically black — she was so proud of being a black woman." Owens said the museum has held services for many dignitaries, most famously Rosa Parks: "It was important that Aretha take her place next to them and lie in state there." For all the formality, however, Owens said the viewings are intended to be welcoming and accessible for her legions of fans. "She respected them — she understood that if it were not for them, she wouldn't be who she is," she said. Luke Song, who made hats for Aretha Franklin for nearly 20 years, discusses what she was like and how his life changed after he made the hat she wore to President Barack Obama's 2009 inauguration. She had strong loyalty to her family and fans to her last days. "What you see with her is what you get," Owens said. "She was a fighter — she fought this disease hard, all the way to the end." Owens stressed that the viewing and other events could not happen without a group she calls "Aretha's angels." Franklin never spoke about her wishes, Owens said, but she hopes the services are what "she would have wanted and that she would have been proud of."